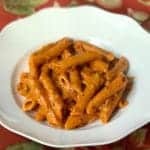 One-pot Penne in Tomato Cream sauce made in Instant Pot or Pressure Cooker. This is a very quick and easy meal, perfect for weeknights. A favorite for both kids and adults, and a great option for gatherings. It takes maximum 20 minutes from start to finish. Pair it with a soup or salad for a perfect dinner. I have been using the pressure cooker for a long long time. But before the instant pot, I never thought of cooking pasta in the pressure cooker. However now with the instant pot community on facebook, I can cook so many new things in my pressure cooker or Instant Pot. 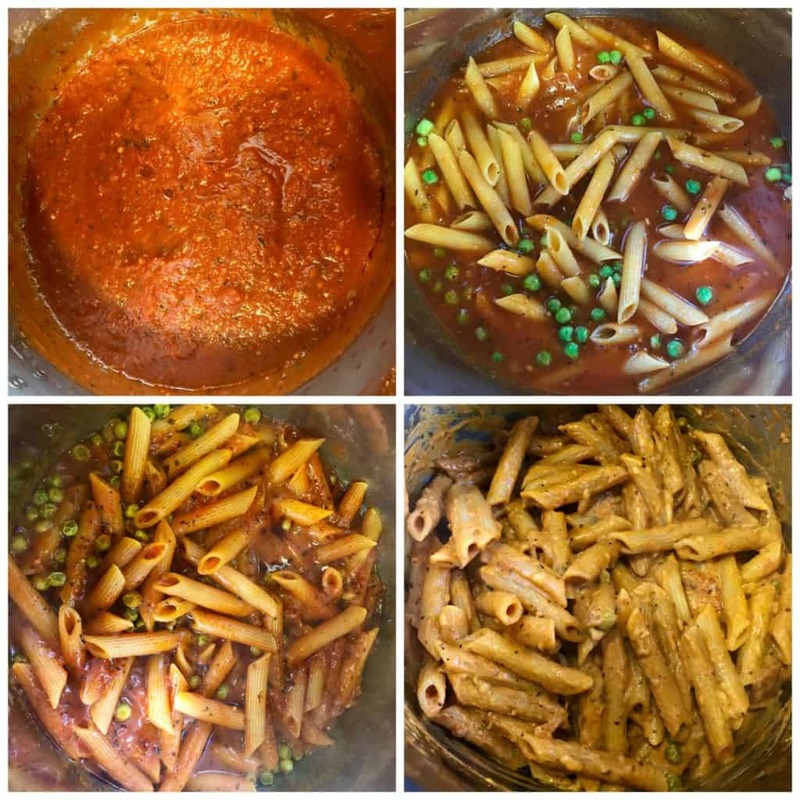 In this recipe, I used penne pasta and a store brought marinara sauce. You can use any type of pasta such as bowtie, ziti, etc. Also, use any type of tomato based pasta sauce, however choose the one with no or very very minimal cheese. As we are pressure cooking the sauce and penne together in the pot, we don’t want the cheese in the sauce to get stuck at the bottom of the instant pot insert. You can also choose to make the sauce at home. Start the instant pot in sauté mode and add the marinara sauce to it. Let it come to a boil. Then add in any veggies of your choice. I only added green peas, but you can add others too, such as bell peppers or mushrooms. Stir in the penne. Now we are ready to pressure cook the penne. Change the setting to manual mode for 4 minutes. For al dente, cook for 1 minute less than half the time recommended on the box. Add one more minute for well done pasta. For example, if the pasta box says 12 minutes, then I would pressure cook for 5 minutes. I prefer to cook al dente and then add a minute or so on sauté mode if needed. When the instant pot beeps, quick release the pressure manually. Then stir in the cream and cheese to get the rich creamy flavor. 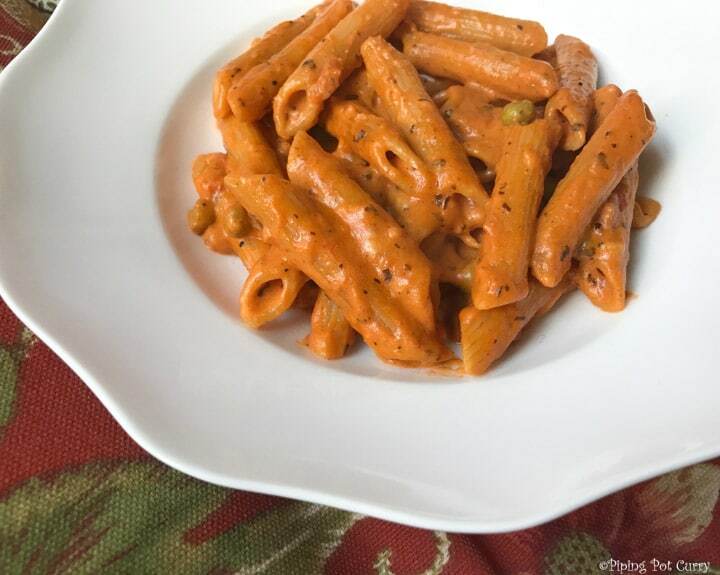 The penne in tomato cream sauce is ready. If it is not the exact consistency you like, change to sauté mode and cook for a couple of minutes. It came out perfectly for me and I did not have to cook it any longer. 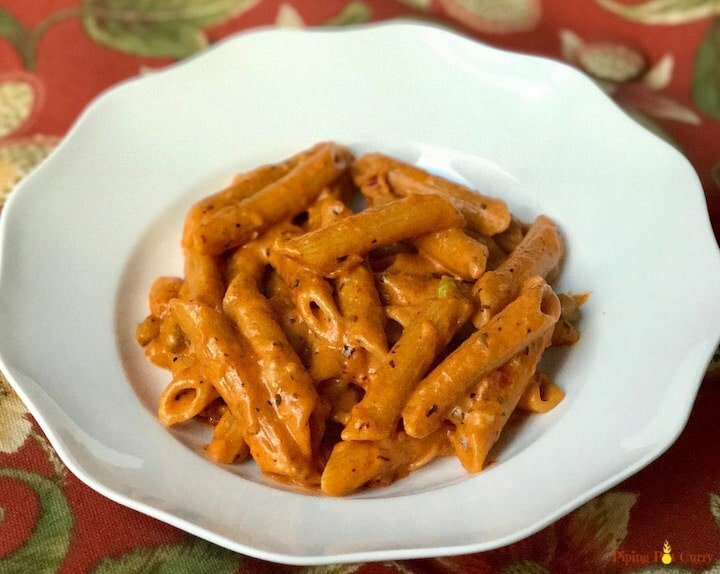 One-pot penne in tomato cream sauce made in Instant Pot. Start the instant pot in sauté mode and heat oil in it. Add the garlic and cook until it is golden brown. Add a cup of water and then stir in the penne and green peas. Scrape if anything is stuck to the bottom of the pot. Most of the pasta should be covered in the sauce and water. If it is not, add some more water. Close the instant pot lid with vent in sealing position. Change the setting to manual or pressure cook mode at high pressure for 4 minutes. The time to cook is usually 1 minute less than half of the suggest time on the pasta box. This will result in al dente pasta. Stir in the cream and cheese, so it is mixed well with the sauce. Add in lemon juice and salt to taste. Penne is ready to be served. Tip: Remove the steel insert from the instant pot, so the bottom does not continue cooking from the heat. Important: In newer versions of Instant Pot, many readers are facing a Burn message. If you have ever seen a Burn in your instant pot, I recommend skipping step 2 and adding the marinara sauce just before pressure cooking. Just spread the sauce on top of the penne, do not stir it. I made this pasta for the first time in an instant pot. I pressure cooked for 6 mins instead of 4 as my pasta was whole grain rotini (was out of penne). I have IP ultra and I was worried it would burn. It did not burn, but some of my sauce had stuck to the bottom. So may be I ll try with 5 mins next time for rotini kind of pasta. I think 4 for penne would be perfect though. I did not have peas or cream so I replaced with whatever I had in the fridge – southwest style protein blend and mascarpone 😛 .The pasta turned out to be uber delicious. Even my husband who doesn’t like red sauce pastas had two servings of it. I am never going back to stove top pasta again. Thank you so much for this recipe. It is quick and delicious and doesn’t ask for too many ingredients, which makes it perfect for a lazy day meal. Hey Deepika – Glad to hear you enjoyed the pasta. Thank you for sharing the changes you made. We love this pasta for the ease and quick dinner on lazy days too! It turned out so good. I changed recipe a little by adding my own pasta sauce and homemade veggie broth. I used wheat pasta so I had to cook it for 6 minutes with natural release. I originally cooked it for 5 mins but then I had to add 2 more minutes for better cooking. I didn’t add peas(my son hates peas) and cream but still it was so gooood. Thank you so much. It is so easy! Hey Pankti – Glad you enjoyed the pasta. Thank you for sharing the changes you made! I recently came across your site and just bought instant pot. Perfect timing. just made this pasta and it’s come out delicious. Will be trying more of your recipes. Perfect blog for time constraint working moms like me. Hey Anu – Welcome to the instant potters club! Glad to hear you all enjoyed the penne. Would love to hear if you try any other recipes! Hey Heena – So glad to hear you and your husband enjoyed the pasta. It is great to hear that the one-pot recipes are helping you. Thank you so much for sharing back your review! I have cooked many recipes in the IP since aquiring it last year, however I never cooked a one pot pasta dish! Your recipe was very helpful in the notes to prevent the dreaded “Burn” code from showing up, because not all IP pasta recipes address this common issue, especially when cooking thicker tomato based sauces. I made a different version of pasta. I made white sauce veggie pasta and turned out delicious. I am new to using IP and followed your instructions. It was the first time I made pasta in IP!! Thank you for the information. Details: 1.5 cups milk and 1 cup water for 2 cups of pasta. 1 tbsp of all purpose flour. 4 minutes of IP and it was ready!! Hey Nikita – Glad that the guidelines helped to make white sauce pasta in your new instant pot. Thank you for sharing the details of how you made the pasta.